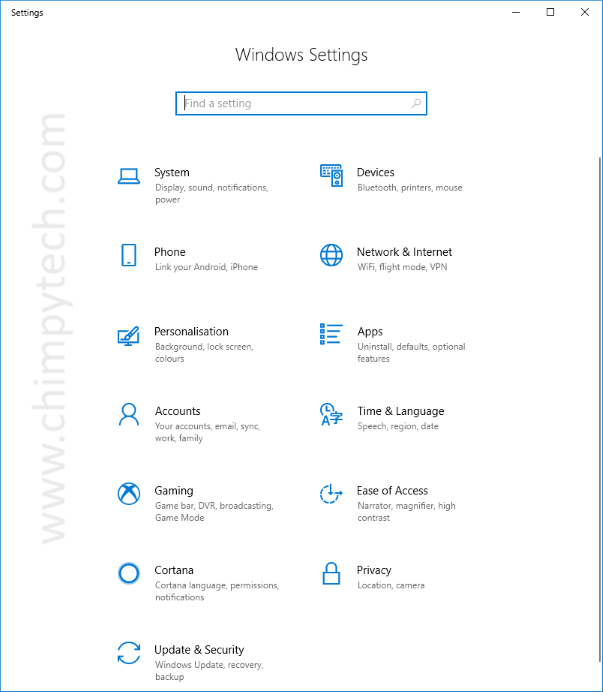 For those moving to Windows 10 from an older Operating System you may look for the Control Panel to makes changes and customisations but this has now moved to a new place called ‘The Settings App’. Open the Windows menu by clicking the ‘Windows Button’ in the bottom left and then select the ‘Gear’ icon. Open the Windows menu by clicking the ‘Windows Button’ and then scroll down the Apps list until you reach ‘S’ and the Settings App will be in the list. Most easy method is to hit the Windows key and ‘I’ at the same time. Once you have opened the Settings App you will see a number of options that deal with various areas of the Operating System. System – this is where changes relating to lower level system settings occur, including things like display settings, and power modes. Devices – Options here make changes to peripherals and devices attached to your PC, including printers, input devices, and driver updates. Phone – This section allows you to link your phone to your PC and share information, apps etc. Network & Internet – All settings related to wired and wireless networking, and connections to the internet. Personalisation – Options relating only to the currently logged in user account. Apps – Options here generally deal with adding / removing applications and setting the default applications for certain file types but there are other options here too. Accounts – settings related to your user account including syncing and sign in options. Time & Language – Setting based on your geographical region can be adjusted here. Gaming – Various options including Xbox and gaming recording / broadcasting features. Ease Of Access – Options for assisting users with disabilities such as visual or aural impairments. Cortana – Options for setting up and using Microsofts digital assistant. Privacy – Options dealing with the camera, microphone and location tracking among others. Update & Security – Options for Windows Update, Windows Security Center, and backup / restore.